You’ve finally arrived at your new house and it’s time to get everything unpacked! Careful preparation in the packing stage will make this step much easier, and hopefully you’ll find that you’ve already done most of the hard work. With a little organization ahead of time, this can be one of the most fun parts of moving. Have your most essential items packed into a box or two that you can access right away. Pack these boxes with the supplies you’d most need if you were going camping: clothes for the day after, blankets, toothbrushes, shower supplies, even some snacks. This way, if you don’t finish unpacking in the first day, you’ll still be able to get dressed in the morning without having to dig through all your boxed belongings. Start by bringing all those carefully labeled boxes to the rooms to which they belong. Kitchen boxes go to the kitchen, living room boxes go to the living room, and so on. 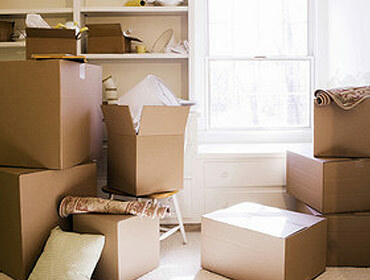 Then you can start the task of unpacking efficiently and in the order that will be most helpful to you. The kitchen and bathroom are good places to start, as these are rooms that you will probably want to use right away. You can always sleep on a hastily placed mattress for the first couple nights, but having easy access to food, cutlery, and a shower will make the unpacking work much more manageable. Get the furniture set up before you try to unpack all the little things. Drawing out a plan ahead of time would be helpful, but if you’re the kind of person who really needs to feel out the room before you plan to set it up, then you can start by placing out the largest pieces of furniture and moving down from there. It will be much easier to shift your furniture around if you have a clear floor free of knickknacks! Once you’ve got the essentials and the big pieces of furniture in place, it’s mostly a matter of figuring out how you want organize the rest of your belongings and keepsakes. This is one of those rare times where you’ll get to start with a clean slate, so grab some storage bins and some extra shelves and use this opportunity to create the kind of streamlined, neat and organized house you’ve always dreamed of having. Everything will look fantastic, for the first few weeks at least!